In a landmark decision South Australia will become the first Australian state or territory to implement permanent minimum overtaking distance when overtaking bicycle riders. To begin on 25th October the new law is part of a range of safe cycling measures to be implemented in South Australia following recommendations by a Citizens’ Jury in January. The new rules will require road users to give bicycle riders at least one metre on roads with speed limits of up to 60kmh, and 1.5 metres for anything above that speed. Amy Gillett Foundation chairman Mark Textor welcomed the South Australian Government’s decision to become the first Australian state to pass the rule into law and congratulated Premier Jay Weatherill and Minister for Transport and Infrastructure Stephen Mullighan for the history making initiative. “The decision is a breakthrough for the Amy Gillett Foundation and marks a significant milestone in the foundation’s history,” Mr Textor said. Mr Textor said with Queensland currently undertaking a two-year trial, a trial in the ACT to commence in November and now South Australia passing the minimum overtaking distance into law, we are seeing the commitment to making bike riding safer spread across Australia. 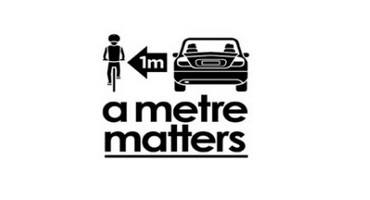 “Amending the road rules to mandate a minimum overtaking distance will help reduce crashes between vehicles and bike riders by changing behaviour. We know that the ‘one-metre rule’ trial is working in Queensland and it will have an immediate impact on the safety of bike riders in South Australia,” Mr Textor said. Amy’s mother, Mary Safe, said “we are thrilled that South Australia is leading Australia in safe cycling. The public consultation earlier this year showed very strong support for these improvements to bike rider safety”. South Australian Minister for Transport and Infrastructure Stephen Mullighan said the rules aimed to improve road safety and cut the number of accidents. “All cyclists this summer will be able to use our roads knowing there will be new rules in place to enhance their safety,” Mr Mullighan said. Bike SA chief executive officer Christian Haag said the trial is a welcome protection for bike riders in the South Australia. A national update on a meter matters and the current status in each state and territory can be found in this document.